Update: Here is a report on the autopsy. The facts directly contradict the false information police apologists are sending around the Internet. Note that the Missouri governor blamed the violence on the black community, not on the police who enraged the black community by gratuitously murdering a black teenager. One reader suggested that the macho goon thug cops with their military gear should be sent to Iraq where ISIS would cut them to ribbons. I wasn't surprised at some of the crude comments and hatred expressed toward blacks that came from a few white male anti-immigration Republicans in response to my article Cops Gone Wild. A few were so choked with rage over a "f****** pinko-liberal-commie" who would take the side of a "black bully thief" over the police that they never read beyond the introductory comment about Ferguson. Criticizing police can ignite the same kind of hysterical hatred as criticizing the Israeli government's murder of Palestinians. As readers know, I often emphasize that a significant percentage of the population is incapable of thought and rational response. They want to hear what they want to hear and go into a rage when they don't. They read not to learn but to have their ignorant biases substantiated. Indeed, the media seems to speak with one voice -- the government's. Even academic freedom has been terminated in universities. There are so many examples. One of the most notorious examples is the case of Professor Norman Finkelstein, whose parents were holocaust survivors. Finkelstein, who is Jewish, is a distinguished scholar who became a high profile critic of Israel's misguided and immoral policies toward the Palestinians. The Zionist Lobby was able to reach into DePaul University, a Catholic university, and cause the cowardly president to overrule the decision of the Political Science Department and the College of Liberal Arts and Sciences Personnel Committee, supported by the student body, to grant Finkelstein tenure. Zionist attacks on American academic freedom are routine. Professor William Robinson of the University of California, Santa Barbara, tells the story of his experience with the Zionist Lobby on truth-out.org. The Zionist Lobby's unethical and immoral tactics create massive hostility toward Jews in general. From time to time I receive emails upbraiding me for refusing to blame everything wrong in the world on Jews. The extremism of Zionists prevents many critics of Jews from recognizing the fact that the strongest, most moral voices against Zionist extremism come from Jews themselves including some Israeli citizens and the Israeli newspaper, Haaretz. Jewish critics of Israel's behavior cannot be called "anti-semites." The Zionist Lobby invented a new term for Jews afflicted by a moral conscience -- "self-hating Jews." The Zionist Lobby with its ridiculous "enforcement organizations," such as the ADL, by misusing the "anti-semite" accusation have made "anti-semite" and "self-hating Jew" badges of moral honor. Once upon a time "anti-semite" referred to a person who disliked Jews in general and perhaps wished harm to be inflicted on every Jew. Today "anti-semite" means a person who objects to illegal and immoral policies of the Zionist state, the government of which does not speak for all Jews or even for all Israelis. Zionists focus on silencing their critics because Zionist policies cannot stand examination. The gratuitous violence employed by police is no more justified than the gratuitous violence employed by the Israeli military toward Palestinians. "Law and order conservatives" confuse police accountability with the coddling of criminals and terrorists. 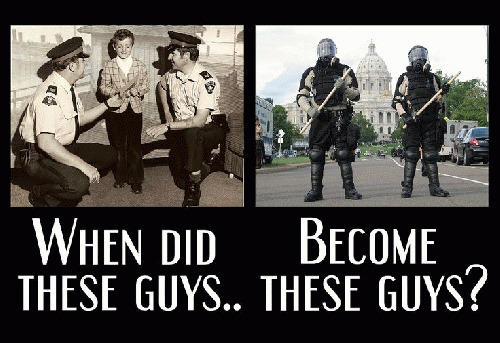 They are unable to comprehend that unaccountable police are a greater threat to them than are criminals without badges.